Firstly, my Mum was here and so I had someone to watch it with. And while she is rather shy of leaving a comment on my blog, she has not problem making comments on my sofa. A bit like my own personal Red Button. Secondly, I managed to eyeball a spoiler on twitter and so had to keep my self in check while we watched so as not to give the result away to mum. So, as you see Mum was very much the word. Now, let’s talk about dance baby. Before Bibsey wakes up from her nap. Dobbo watch is over: On the dance floor we had Dobbo but no Robbo. Bendan stepped in gallantly to cha cha cha – and as Bruno so flatteringly put it he “is like parmesan – he goes with everything”. Sadly, Anita found herself in the bottom two and then out. Boo and hoo. But really she had probably peaked a couple of weeks back. I just wanted her to stay because she was such a good Strictly contestant – her joy in the dancing was plain to see. Holly go mightly: Still hanging on in there, back in the arms of Artem and in a red hot dress for a weirdly hot foxtrot. But is was not enough to keep her out of the red light of doom for the second week in a row. The audience kept her in and – although throughout I haven’t really been a fan – that was the right thing as she did not deserve to go out on that dance. Jones and Jordan: A quirky charleston, but not enough swivel. It did of course afford us one of my favorite moments of the sunday night show when Bruno got up from Claudia’s sofa to show us how it is done. Beau Savage: Len called it a ‘shamba’ and my mum said that it was his time to go… we turned our backs for one second the pair of us and the next thing we know he has whipped his trousers off! What was that all about? Worth it just to see the look on Craig’s face. Sweet Chelsee: I was really looking forward to watching their Argentine tango and I wasn’t disappointed. Does anyone else think that all this talk in the training room about her not being able to work up a passion for Pasha is all a little bit ‘the lady doth protest too much’? 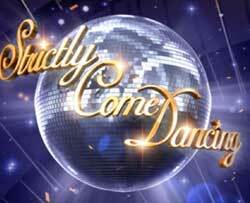 Harry McFlys around the floor: A fab quickstep with sway we are told (by my Mum and Len Goodman). Craig could only find fault with his lazy left foot (the only thing standing between Harry and four 10s) and mum wanted more personality from him. Project more dear Harry but please god don’t go the way of Donovan. Highlight of the swingathon: Tonioli’s spirited and verbose time filling that allowed Harry the chance to get changed between his quickstep and the swingathon. That boy’s got STA-MI-NA darling. And so has Harry. So Dobbo’s gone and my mum’s gone (on a jet plane this morning) and that’s it for another week. We are left feeling a little sad here at Bibsey Towers and would love to hear your thoughts on this week’s show sans Russell – a little less colourful, non?